If you’re a trailblazing user of FCPX, 10.0.6 or newer, you may have noticed a bug: rendering your project after using certain effects leads to random frame glitches. 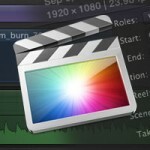 According to Aharon Rabinowitz of Red Giant Software, the problem lies with FCPX and Apple. While Apple is aware of the issue, there has been no information on any upcoming patches. In an earlier blog post, the Red Giant Team points to a workaround: rendering your project directly in Compressor. This isn’t ideal for users who don’t already own Compressor, an app sold separately from FCPX. For the time being, if you’re using plug-ins from any third-party companies and don’t own Compressor, you should export your project to a frame sequence and spot check for any corrupt frames. If you come across any corrupt frames, re-render the affected area. You can then take the master frame sequence and master audio to render out a deliverable without issue.